Art is a platform that can help people process trauma. As a gathering space for creativity, community, and culture in downtown Basalt, the Art Base is honored to use visual art to help promote reconciliation, avoidance of hate speech, and the development of alternative points of view. As a result of the Lake Christine Fire, community is now more important than ever. The Art Base, a nonprofit art center, puts an emphasis on bringing people together over a shared interest in the merits of visual art as a vehicle for connection, discovery, and understanding. They are proud to have been present at the Basalt and Carbondale Red Cross relief shelters—helping families and youth use creativity projects to help cope with and process the stress of the fire and evacuations. Art supplies were also dropped off at The Orchard in Carbondale, including coloring books generously donated by Staci Dickerson. 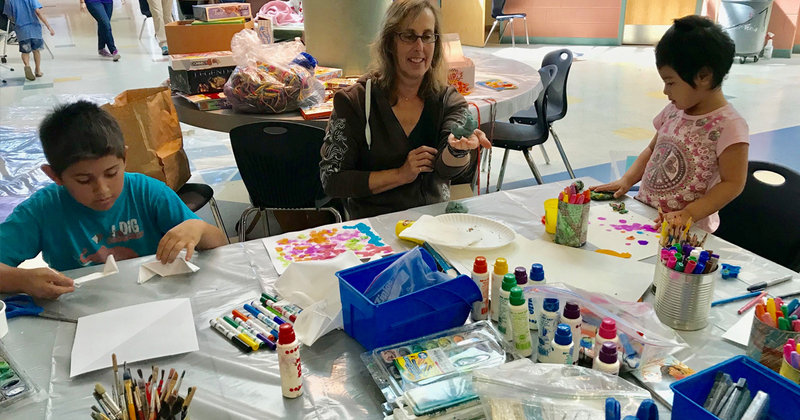 In response to a community request for support for children and families, the Art Base will offer a free and special session of Art, Healing & HOPE, for families on Saturday, July 14 from 3:30 – 5:30pm. Taught by Licensed Clinical Social Worker and Registered Expressive Arts Therapist Sheri Gaynor, participants will have an opportunity to process feelings and emotions in response to the Lake Christine fire. The event will focus on resilience and the power of community with the opportunity for questions and discussion. Designed as a healing family event, all ages and experiences are welcome. Please note that parental participation is requested. The focus is on process, rather than the end result. Registration is available online at theartbase.org/education/, see family tab. On Sunday, July 15, concurrent with the Basalt Sunday Market, the Art Base welcomes families to participate in Family Crafternoons, an all ages opportunity to visit the galleries and participate in art and craft making for the whole family. From 10am to 2pm, this weekend’s project will feature firefighter thank you card making and an opportunity to participate in a community prayer flag installation for animals, families, and firefighters affected by the fire. Supporting Colorado-based student, emerging, and established artists, the upcoming exhibition at the Art Base, David Notor In Retrospect, showcases 15 years of pastels and oil paintings, depicting Colorado and Southwest landscapes in an American Impressionist style. Nationally exhibited artist, Notor’s work reflects an awareness of the fluctuations of light as it transforms color. The opening reception will take place Friday, July 13, from 5-7pm and a member’s only art talk and demonstration will be held Wednesday, August 1, at 5:30pm. Generously sponsored by Barbara and Pat McMahon, exhibition dates are July 13 – August 3, 2018. The Art Base extends infinite thanks to the fabulous teachers and artists who volunteered at the shelters, and to the fighters and community response teams for keeping our community safe.